Sunshine, aka TC's Slash, is a beautiful, 2½-year-old red fawn female born September 5, 2005. Her sire is Kiowa Sweet Trey and her dam is Landslash. Sunshine's 39-race career began on May 13, 2007, at Dubuque, Iowa, and ended on February 20, 2008, at Valley Race Park when she fell in the first turn. 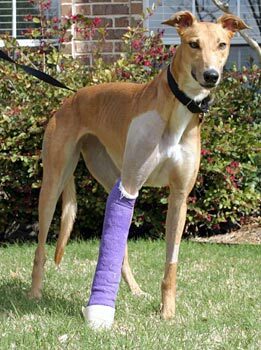 Sunshine's right ulna and radius were fractured. Sunshine arrived with Buzz in Dallas on Sunday, March 16, with the help of many caring volunteers who drove both of them 10 hours from Harlingen to Dallas. Upon arrival both were taken to VCA Preston Park Animal Hospital where Dr. Jeff Ellis took x-rays to determine the extent of Sunshine's injury, referring her immediately to Dallas Veterinary Surgical Center where Dr. Doug Lange performed surgery on Tuesday, March 18. 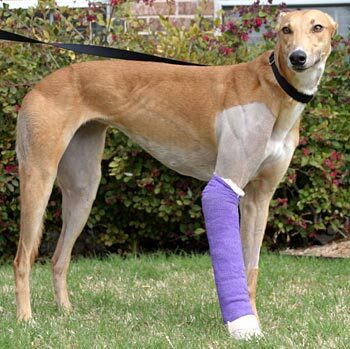 Sunshine's fractured right ulna and radius were stabilized with a 10-hole plate and screws. Sunshine was put in a splint and will have bandage changes every 7-10 days during her 6-week recuperation period. It is imperative that Sunshine be kept quiet in her foster home during this time to insure the healing process occurs without incident. It is not known at this time if Sunshine is cat tolerant. Sunshine's splint was removed and she is being leash walked in her foster home. She goes in to see Dr. Lange for follow up radiographs on May 15, at which time it is hoped that she will be released from his care. Sunshine walked into our home and it was as if she had been here for years. She doesn't have a skittish bone in her body! She readily accepted my three-year-old little girl and loves getting hugs and kisses from everyone. Sunshine is also very tolerant of my mini schnauzer and occasionally acts like she might want to play with him - she just doesn't know how to play with a dog that small! She also gets along well with the resident Greyhound. Sunshine loves to be wherever you are, either lying on the floor or standing beside you. She really wants to join us on the bed or sofa but she isn't allowed and hasn't tried to cross that boundary. Her cast is off and she has been limping less every day. She loves squeaky toys, but they don't stay squeaky for very long... she has figured out the secret of killing the squeaker without marring the outside of the toy! Within a day all our dog toys were mysteriously silent!!! She also likes to chew the legs off the little animal-shaped ones. She can be opportunistic, and every great once in a while the temptation of food on the counter or coffee table overcomes her manners and she tries to get a nibble. We are working on this. She has not had a single accident in the house. She is very good about whining when she needs to go outside. We have discovered Sunshine does not like thunderstorms, but have found that putting her in her crate seems to calm her down very well. She goes in her crate only when I leave the house but otherwise spends most of her time dozing upside-down in one of the many dog beds throughout the house. She also sleeps very well at night on a dog bed next to ours. 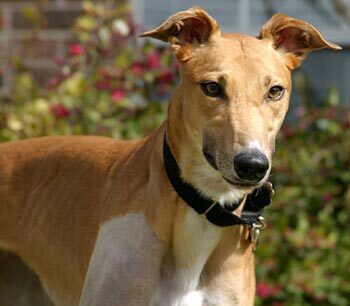 Sunshine is a delight to be around and has the most beautiful feminine face and those classic expressive Greyhound eyes. She will be a wonderful addition to a very lucky family.